So he'll be DLC or did I miss his voice somehow? Where is he? cant find him. 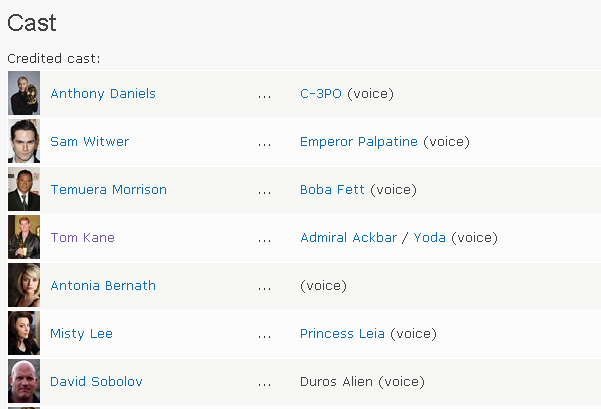 Well they either slipped up there, or they just mean he has done yodas voice on other things. If yoda is going to be in this game, i hope he is just a voice like ackbar, because the amount of people complaining about not being able to hit him, would me much higher than the a-wing complaints! I guess the hit box would be a bit of a problem...but if he's old will he be super agile? Well it would be a strange choice to add him if he has to hobble about with a cane. I guess his special abilities could be throwing slippers at you and smashing you around the head with a newspaper. He uses a cane in the prequels to no ill effect and he's already 880ish at that point. I think Yoda will just use the force to throw rock and debris.